Debt, distance & divorce are likely to complicate how Millennials will care for aging Baby Boomers. The typical caregiver is still a 50-something woman feeding, bathing and transporting her ailing mother. But it’s estimated that about 10 million millennials now provide such help, usually to a parent or grandparents, according to recent reports by AARP and the National Alliance for Caregiving. This means that millennials (ages 18-34) make up nearly a quarter of the approximately 44 million caregivers in the United States. There is an equal chance that a millennial caregiver identifies as male or female. According to the NAC and AARP report, the “typical” millennial caregiver is 27 years old and provides support for a parent or grandparent with a physical condition requiring care. Millennials may also provide care for spouses, siblings, close family friends, and their own children. The care recipient may have care needs related to a mental illness, substance abuse issue, developmental or learning disability, HIV/AIDS diagnosis, or an age-related disease such as dementia or Alzheimer’s. In addition, millennials are increasingly providing care for their loved ones with injuries sustained in military service (e.g., traumatic brain injuries). So, in other words, the millennial caregiving landscape is wide and ever changing. As the baby boomers turn 65 at a clip of 10,000/day until 2030, the burden of care will fall even more on millennials. This has been termed the “Caregiving cliff,’” in that the support-ratios are expected to be three caregivers available for everyone person needing care by about 2050. In short, millennial caregivers will be facing increasing physical, emotional and financial strain in providing for their care. There is reason for concern in that the lack of support from either employers or the government for caregivers nationwide will only increase the challenges facing millennial caregivers. While every generation experiences caregiver challenges, the Millennials might have an unfortunate convergence of forces that may conspire to create a caregiving crunch – these include debt, distance, and divorce. Student debt plagues college-educated Millennials. MIT AgeLab research on student debt shows that young college graduates may be shouldering unprecedented debt, but its implications are being shared across the generations. The average college graduate as of 2015 has $30,100 in debt. This burden is credited with being the primary reason why so many 20- and 30-somethings are delaying marriage, parenthood, and home ownership. Debt will likely add to caregiver stress. Starting life, a little later and taking on more debt as part of each successive life stage is likely to make it more difficult for many Millennials to choose careers that pay less but provide more workplace flexibility to care for mom. Moreover, college debt on top of housing, transportation, and other life costs may limit the financial capacity of soon to be middle-aged Millennials to outsource many caregiving tasks to eldercare service providers. Debt and the costs of caregiving may change the course of not only Millennials’ midlives but also their retirement years—if it is possible to speculate that far into the future—registering as another cost that must be accounted for in the lifespan. Caregiving as a retirement cost is already something that should be taken seriously by the current generation, and by financial advisors. It will only grow more significant. Distance may be the biggest upheaval involved in becoming a Millennial caregiver that may paradoxically fall most on relatively affluent individuals—those who were able to move away from home for college and did not come back. Millennials have been less likely than preceding generations to come back to their hometowns after a young adulthood spent in a distant city. Whether out of preference or need, they have opted to stay. While advancing telecommunications technology has been credited with the death of distance in almost every life endeavor, e.g., work, travel, many caregiving activities remain high touch. Providing emotional support and serving as a medical advocate and coordinator for an elderly mother, among other tasks, are, for now, close and personal roles. Higher divorce rates among the Baby Boomers will force more adult children to choose which parent they care for. Divorce is often about dividing property, but the unprecedented high divorce rate (so-called gray divorce) amongst the Baby Boomers may force many Millennials to ask, who gets the parents? Siblings will ask each other, “Which of us gets along better with Mom? Who will do well with Dad?” Adding to this is the fact that the Boomers had far lower birthrates than their own parents—meaning that the unpaid caregiver labor pool will be lower. Only children will have to take on the responsibility alone, potentially upending their lives in doing so. Every generation faces unique challenges. However, no generation has shouldered the sheer number of older adults that will be the coming tide of aging Baby Boomers. 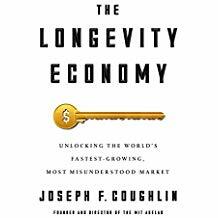 But as I write in my book The Longevity Economy, every challenge is, in fact, an opportunity. Business, government, NGOs, employers, communities and neighbors must be called upon to create new ways to provide care within the context of tomorrow’s Millennial caregiver. This will most assuredly mean developing a wide range of innovations that include affordable care technologies, high touch services, caregiver friendly and flexible workplaces, financing options, etc. Moreover, while the Baby Boomers may be aging, they are far from done. It may be our best gift to our children to develop care plans, options, savings, and innovations today to care for us tomorrow. Superb book flows with great stories and brilliant insights. Demographics are destiny and there are ample examples of how our demographics will shape society, business, design, medical care, and policy. Highly recommended. Connect with support online. Remember there are 10 million of you and the numbers will only increase! Bottom line, stress, guilt, and over-extending will burn you out. When a caregiver is too focused on others, they can neglect their own needs and suffer. Get plenty of rest and take breaks, when possible. Without preparation, millennials who take time off to care for a loved one may not have their own money set aside for the future, including retirement, said Grace Whiting, chief executive of the non-profit National Alliance for Caregiving. “Millennials have to plan for the financial part, as they’re getting older, too,” Whiting said. Organizations including the Alzheimer’s Association (alz.org) and the Women’s Institute for a Secure Retirement (www.wiserwomen.org) provide resources to help caregivers prepare for long-term financial sustainability. The average millennial caregiver is employed and works 34.9 hours a week, according to the AARP. But caregiving can get in the way of career advancement. Different states have different laws protecting caregivers from discrimination. You can find more about your rights on AARP’s website (www.aarp.org/caregiving/). Every millennial caregiver’s life changes in different ways, so avoid comparing yourself with others. Some will get college degrees before you—there are different milestones and goals reached at different times than peers. Beeton, who got a college degree online to continue caregiving, reminds herself that it is okay if she hits milestones at different times than her peers.